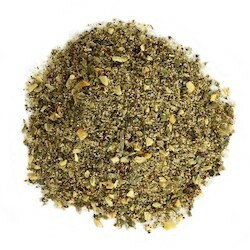 A savory seasoning blend with a touch of heat to spice up your grilled vegetables. Directions: Toss 1 pound fresh veggies with 1 tablespoon of olive oil. Add 1 tablespoon grilling seasoning and stir to evenly coat. Ingredients: organic onion, garlic, bell pepper, sea salt, black pepper, cumin, coriander, oregano, cilantro.